Measuring accurately is probably the most important cooking skill in the kitchen. Home Economists in test kitchens spend many hours testing recipes with different measurements in a process called 'tolerance testing.' A recipe must perform well even though the ingredient amounts are changed; if the recipe fails tolerance testing, it is not published. Even though the recipes in cookbooks are quite 'tolerant,' the cook still has to follow the basic rules of measuring for good results. To begin, make sure that you have actual commercial measuring utensils. Buy nested (graduated) measuring cups to use for measuring dry ingredients. Buy measuring spoons to use for accurate measuring - your stainless coffee spoon just isn't the correct tool! For liquid ingredients, you need a clear glass or plastic cup with a pouring spout. Graduated measuring cups are made in 1/4 cup, 1/3 cup, 1/2 cup, 1 cup, and 2 cup sizes. Liquid measuring cups are usually either 2 cups or 4 cups. Measuring spoons usually range from 1/8 teaspoon, 1/4 teaspoon, 1/2 teaspoon, 1 teaspoon, and 1 tablespoon. It's possible to find other more esoteric utensils including 1/8 cup, 2/3 cup, and very small spoons. Sets that measure "a pinch," "a smidgen," and "a dash" do in fact exist, although they are not standardized measurements. Flour: Stir flour in the storage container or bag. Using a large spoon, lightly spoon flour from the container into the measuring cup. Do not shake the cup and do not pack the flour. Using the back of a knife or flat blade spatula, level off the flour even with the top edge of the measuring cup. Don't use the measuring cup to scoop the flour out of the container. You can end up with 150% of the correct measurement if you do this! One cup of correctly measured flour should weigh about 120 to 125 grams. Baking Powder and Baking Soda: Stir in the container. Using the measuring spoon, lightly scoop out of the container. Use that knife to level off even with the top edge of the measuring spoon. Sugar: Sugar is measured by scooping the cup or measuring spoon into the container or bag until it is overflowing, then leveling off with the back of a knife. Brown Sugar: This needs to be packed into the measuring cup. The sugar should retain the shape of the cup when it is dropped into the other ingredients. Powdered Sugar: Powdered sugar usually needs to be sifted to remove small lumps. It is measured by spooning the sugar into the measuring cup from the container, then leveling off with the back of a knife. Liquid Ingredients: Liquids need to be measured at eye level. Using the liquid measuring cups, pour the liquid into the cup. Then bend over, so you are on the same level with the measuring marks. The liquid should be right at the mark, not above or below. Semi-Liquid Ingredients: Ingredients like sour cream, peanut butter, and yogurt are measured using dry measuring cups because they are too thick to be accurately measured in the liquid cups. Level off the sour cream and peanut butter with the back of a knife. Shortening and Solid Fats: Butter and margarine have measuring amounts marked on the sides of the paper wrapping. One quarter pound stick of butter or margarine equals 1/2 cup. Solid shortening is measured by packing it into a cup, so there are no air spaces, then leveling off with the knife. To easily remove fats from baking cups, spray them with a nonstick cooking spray before measuring. You can also use the liquid displacement method for measuring solid fats. For instance, if you want 1/2 cup of shortening, fill a liquid measuring cup with 1/2 cup of cold water. Then add shortening until the water level reaches 1 cup when you look at it at eye level. Pour out the water and use the shortening. Oil is measured as a liquid. 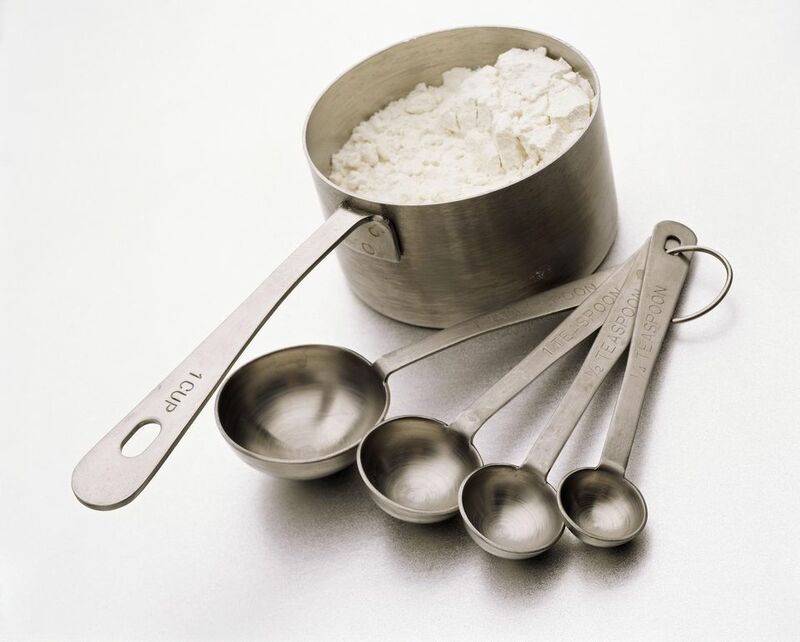 Liquid Ingredients in Spoons: Make sure that you don't measure small amounts of liquid ingredients over the mixing bowl. Consider these classic spoons for your mixing needs). It's too easy to spill, and you don't want 2 teaspoons of almond extract when the recipe only calls for 1 teaspoon! Dry Ingredients in Spoons: Ingredients measured in these small amounts still have to be measured carefully. Overfill the measuring spoons and level off using the back of a knife for the most accurate amounts. Accurate amounts of ingredients like baking soda and powder are critical to the success of any baked product. Chopped Ingredients: Pay close attention to whether or not an ingredient is to be chopped, diced or minced, and whether they are measured before chopping or after. Then the foods are placed in the measuring cup, so the top is level with the surface. When you bake cookies, cakes, bread, pie crusts, and candies, measuring accurately is critical to the success of the recipe. When you are cooking casseroles, soups, stir-fries, and meats, you can vary amounts more, and the result will still be good.